San Francisco — Gallery Wendi Norris is pleased to announce the West Coast debut of acclaimed New York-based artist Simone Leigh. 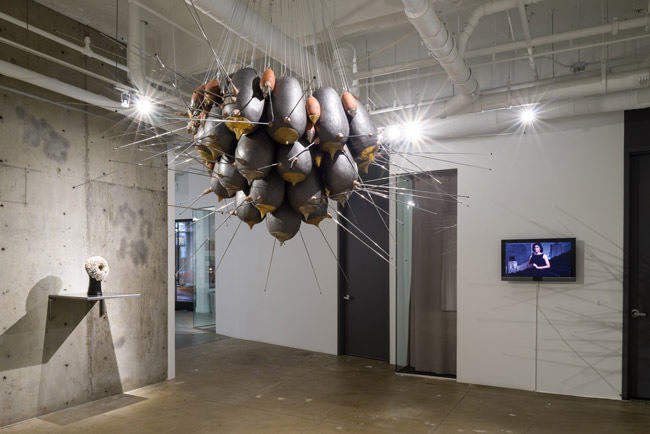 This solo exhibition will feature ten new works, including sculptures, installation, and a collaborative video, and will give Bay Area audiences a substantial introduction to Leigh’s artistic practice, which explores black female subjectivity through her interest in African art, ethnographic research, feminism, and performance. Much like Surrealist masters of the 20th Century, Leigh imbues these organic forms with layers of poetic resonance and meaning, evoking references to human sexuality, racial politics, and dynamic cultural histories. Inspired by ethnographic objects, human anatomy, and depictions of African Americans from American history, Leigh exposes stereotypes about black and female bodies as artificial cultural constructs by transforming them into bold and provocative works of art. 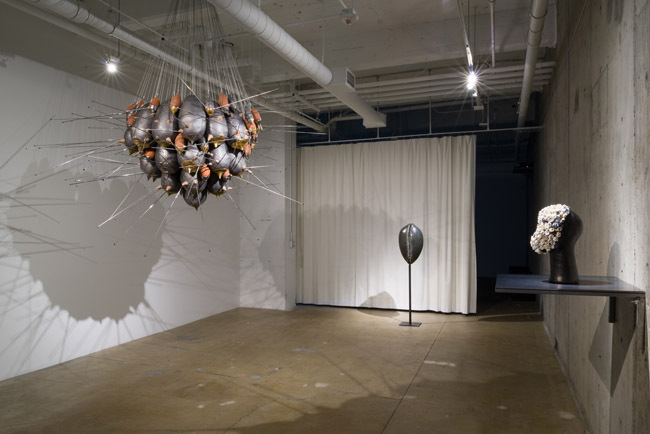 Queen Bee (2008-2013), a chandelier that evolves with each successive installation will feature giant porcelain cowrie shells cast from watermelons, in a brand new, site-specific configuration. Remarkable for its playful, surprising approach to delicate and complex subject matter, it will showcase Leigh’s extraordinary ability to make familiar materials both strange and beautiful. Her ceramic head sculptures also address ideas of beauty and the power invested in representation, combining traditional symbols and iconic forms to parody stereotypes and pay homage to the resiliency of the human spirit. Widely praised in the press, her use of repeated shapes, such as rosebuds or shells, recall the works of Eva Hesse, and the materiality and the thematic content of her work has also drawn comparisons to early Judy Chicago. Similarly, Breakdown a video made in collaboration with Liz Magic Laser, features a haunting and absurdly funny performance by opera singer Alicia Hall Moran that employs everyday language in a meditation on loaded cultural expectations of the concept of “drama”. Leigh will be presenting her work as part of the artist lecture series at San Francisco Art Institute on Wednesday, February 5, 2014 from 7:30-9:00 PM.